After reaching the heights of comic book success in France, the critically acclaimed Isabellae from author Raule (Jazz Maynard, Arthus Trivium) and artist Gabor (Greenworld, Les Patriciens) will be collected in English for the first time. 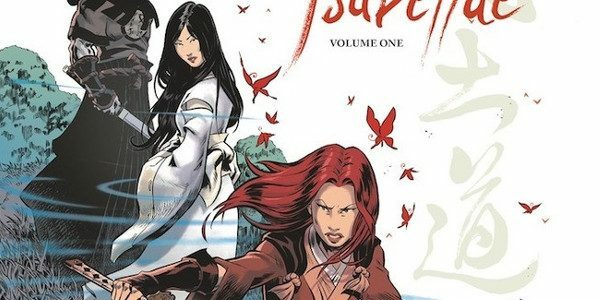 In the midst of feudal Japan, Isabellae Ashiwara, the young daughter of an Irish witch and a samurai master, roams the countryside with her father’s ghost at her side, earning her living as a highly-skilled bounty hunter while searching for her long-lost sister, Siuko. After seven years of searching, the time has come for Isabellae to take charge of her destiny once and for all and face her haunting past. Dark Horse Books is thrilled to present the first volume of Isabellae, collecting the first three French volumes in one compendium and offered in English print-format for the first time in a stunning, hardcover collection. IsabellaeVolume 1 goes on sale August 7, 2019, and is available for pre-order at your local comic shop.